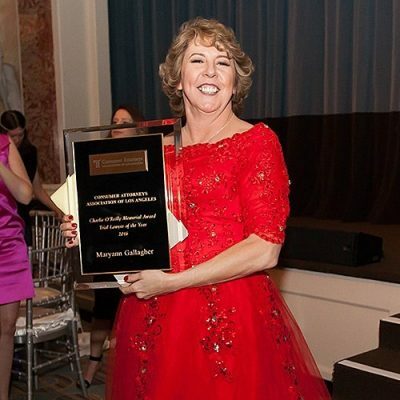 The Nation’s largest local plaintiff’s lawyers association (Consumer Attorneys of Los Angeles) awarded its highest honor, the Charles O’Reilly Memorial Award Trial Lawyer of the Year for 2016 to Maryann P. Gallagher of Los Angeles. Ms. Gallagher tried three employment cases in 2016 where she took on large corporations with highly skilled teams of attorneys and obtained justice for her clients. She has a history of twenty- five years of fighting tirelessly for her clients mostly on her own out of her downtown Los Angeles Law Offices. Ms. Gallagher is only the second woman in the Organization’s 45-year-history to achieve this award. She has spent her time this year speaking to young lawyers to help them in their practices and pass on her knowledge and skills. Ms. Gallagher will be speaking in Las Vegas on September 2, 2017 as part of a prestigious panel of the top attorneys from all over the United States as a “Rock Star of Justice”.